Ahhh…the holidays are here again! A time when everyone looks forward to food, fun, and family along with the celebration of whatever personal beliefs they hold—or not. The holidays, for most people, are a time full of emotion, peace, and goodwill. Therefore, you should take advantage of the fact that by decorating your home, you could tap into all that emotion to land a buyer who loves your home and all the warm positive feelings it gives them. 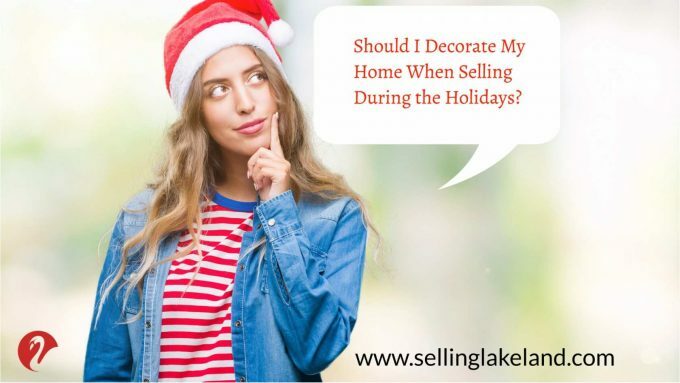 Of course, there is no right or wrong way to decorate for the holidays; however, with that being said, since you are selling your home, you will have to be a little more careful about how you decorate it. Because if you want to sell your home quickly and for top dollar, you want to make sure you won’t unintentionally offend anyone. Nor do you want to decorate in a way that hides your home’s features or makes the place look dirty and cluttered. Just because you’re selling your home during the holidays, doesn’t mean you can’t enjoy the season just as you do every year. In fact, it’s more important than ever to create a peaceful, relaxing environment, especially when selling your home, which is a time that is known for being stressful. One of the reasons people love the holidays is because of the way it makes them feel. And a big part of selling a home is based on emotion and how your home makes a buyer feel. Therefore, the holidays give you the added opportunity to create a festive environment that makes your home feel warm and welcoming with all its seasonal sights, scents, and sounds. And, not only that, but, it will make it easier for a buyer to envision themselves living there. So go ahead and take advantage of the season and do it up right. (We will talk more about that in a moment). It’s likely others in your neighborhood will be decorating their homes for the holidays. Therefore, by decorating your home as well, it will make your neighborhood feel more cohesive and make buyers feel as if they are not just buying a home, but buying into a community where they can make new friends and acquaintances. Whether or not to decorate your home during the holidays is a personal decision. You can if you want to and it would probably help sell your home, but you don’t have to. There are several reasons that might make you reconsider decorating your home when selling during the holidays. Your decorations could possibly offend someone. Overdecorating could end up being a distraction from your home’s features. Personalized decorations, Christmas cards, and other embellishments could reveal too many private details about yourself. Some decorations such as live Christmas trees could make your house appear dirty due to shedding needles or make your house look smaller because of the size of the tree and the space it takes up. HOT TIP: If you decide to decorate your home for the holidays, it would be a good idea to take some pictures of what your home and each of the rooms looked like before you decorated. This will enable a potential buyer to see what your home looks like underneath all those decorations. And, it will make it easier for them to envision themselves living there once the holidays have come and gone. 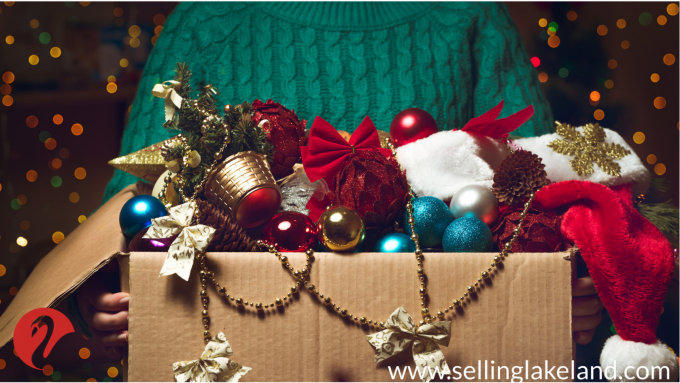 Decorating your home for the holidays while trying to sell your home is an art. Because you have to decorate in a way that doesn’t offend anyone and doesn’t distract from your homes true beauty and bones. Here are nine great tips for decorating your home for the holidays and in a way that encourages rather than discourages sales. Your home needs to appeal to all types of buyers. Therefore, it’s best to avoid displaying your personalized decorations such as family pictures, ornaments your kids made for you, stockings with your names on them, Christmas cards, etc. It takes all kinds of people to make the world go around. Which is why it’s so important to keep your decorations secular. This will help you avoid offending anyone. There are so many different personal beliefs which is why you never know who might want to buy your house and who won’t because you are something they are not. Keeping it secular doesn’t mean you can’t celebrate according to your beliefs, it just means that this year only, you will have to celebrate generically so to speak. Decorate your home with more traditional holiday classics such as an elegant wreath, garland, and generic ornaments on your tree. Avoid inflatable’s, plastic Santas and reindeer decor, or anything else that isn’t simple and tasteful. A nice fire in the fireplace will give your home a warm and welcoming feeling. It will also touch a buyer’s senses. The fire crackling sound will engage the buyer’s hearing. The scent of the fire will engage the nose. And the fire in the fireplace itself will provide a great visual. You could even go as far as having a bowl of roasted chestnuts displayed as well for an extra touch of holiday cheer. Nothing says the holidays like freshly baked breads, Christmas cookies, or a nice simmering pot of apple cider or potpourri. These scents, for most people, will trigger pleasant memories of Christmases gone by. Presenting a tray of Christmas cookies and/or other holiday favorites will first spark a pleasant memory which will then make it easier for the potential buyer to envision themselves living in your home and making new memories. It could also encourage a potential buyer to view your home more favorably. Decorating for the holidays isn’t just for the inside of your home. The outside should be minimally decorated as well. The first thing a potential buyer will see when he/she approaches your home is the curb appeal. So don’t let that opportunity to grab their attention go to waste. String some simple, nice white lights along the roofline, buy a new holiday welcome mat for the front door, plant (or use potted plants) some seasonal poinsettias or something else around the mailbox, by the front door, or along the sidewalk, etc. Put a live wreath on the front door and use any other decor that’s simple and generic without overdoing it. The last thing you want to do is to have your potential buyers wondering what you were thinking when you decorated your home for the holidays. It’s best to stick with a theme. You can do this by decorating your home with colors that already match your home’s existing decor in as neutral of a palette as possible. Skip the pink, purple, and other bold colors that could easily be distracting. If you don’t want to do that, then stick to white, silver, gold, etc. because these are timeless and tend to go with just about anything. When you use hints of nature to decorate, it will give your home more of a warm, inviting feeling, especially in the middle of winter. Consider decorating with fresh pine sprigs, pine garland, pinecones, fir boughs, holly, chestnuts, glass, etc. You can make simple arrangements and display them in natural baskets. And, if you use cinnamon sticks in them as well, it will make your home look and smell just like the holidays. Whether or not to put up a Christmas tree will depend on the space you have available. 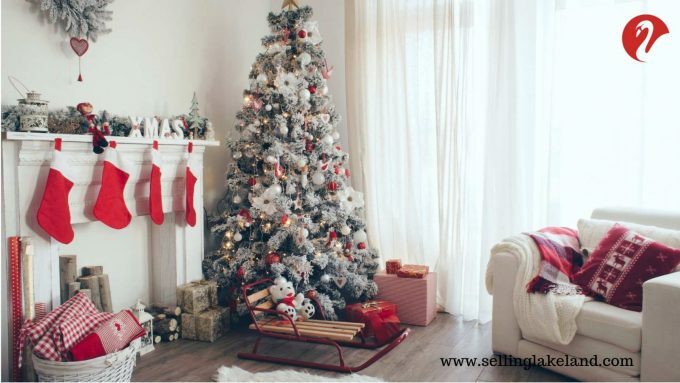 If your space is already on the small side, putting up a tree will make that space look even smaller and that’s NOT what you want when trying to sell your home. However, if you have plenty of room, then, by all means, go ahead, put up a tree and make your home look as festive, warm, and inviting as possible. If your home is on the small side, you could simply buy a small tabletop tree and enjoy the time you have left in your old home while looking forward to moving into your new one. Have fun with your holiday decorating, but be mindful of what not to do as you’re doing it. Keep your Christmas tree size proportional to the space you have. Use greenery and garland instead of banners. Never leave burning candles unattended even if you’re just leaving for a few minutes while a real estate agent shows your home. Don’t over decorate or it could end up being a distraction to potential buyers. Don’t cover up important features of your home, such as the fireplace, etc. with holiday decor. Don’t allow your holiday decor to block walkways. This not only makes your house appear smaller than it really is, but it could also create a trip hazard. Keep your decorations secular so you don’t alienate anyone. For security reasons, don’t leave any gifts under the tree or laying around during showings. Go easy on the Christmas lights because if you use too many it will distract from your home’s features. Put away the Christmas cards. Christmas cards have a tendency to make a room look too personal regardless of whether you hang them on the wall or display them on a mantle or table. It’s best not to hang your Christmas stockings so it will be easier for potential buyers to see themselves living there. Every real estate agent has their own beliefs about whether or not you should decorate your home according to the holiday. However, whatever you decide to do is up to you. Just remember to keep it generic and low key. Why wait until the spring to sell your home when you can use the holidays to your advantage? If you would like to discuss selling your home during the holidays or just need some advice about how to decorate it…or not, please Contact Us today. At Lakeland Real Estate Group, we are experts in selling homes during the holidays and would love to show you just how easy it can be. Who knows, you could be happily settled in your new home before the new year! What would that be worth to you? PRICELESS!